One of the feature enhancements introduced in 5.0.4 is role based pick lists. Pick list fields are used in various forms in vtiger CRM. For example, the Sales Stage field in Potential form is a pick list allowing user to select one of the pre-configured stages (such as Prospecting, Qualification, Proposal, ..) based on the status of the potential. Until 5.0.3 release, the pick list values were the same for all roles (and hence all users). In 5.0.4, Picklist values can be configured for a Role. 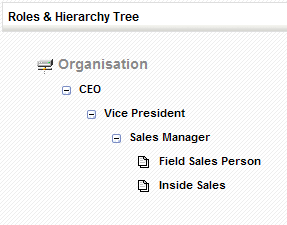 For a given Role, the values associated with Sub-Role (i.,e roles that are below in the Org tree) are also accessible. For example, consider the following Role hierarchy, which shows Inside Sales and Field Sales roles under the Sales Manager role. The pick list for the Lead Status can be configured so that the Inside Sales role can only view a set of choices, and Field Sales Person a different set of choices while the Sales Manager sees the combination of these choices. As shown below, this can be configured from the Picklist Editor (in Settings page). First the role should be selected, and then the CRM Module. The next step is to edit the pick list values for the selected field as shown below. To replace all the values for all roles in one shot, you can use the option Global Delete. We welcome your feedback on this feature. As always, you really do a fine job!!! Thank you for covering this topic in simple terms. I just upgraded from 5.03 to 5.04 and all my picklist are not showing any values, i think this is because of this role based feature. Any solution for this or do I have to create the picklist values again?? Can you please send me your 5.0.3(before migration) and 5.0.4 (after migration) database dump, so that I can analyze and update you on the issue? This is a great feature and thank you for adding it. But what about a Global Add functionality? Some times I may add an individual value that needs to be put across all roles, it gets very tedious. Here is a small write up on vtiger Role Based Picklist. I try to replace all the picklist in one shot, by using option Global Delete but the picklist is still there. I;m using VTiger CRM ver 5.0.4. Please help me how i’m clear off the pickup list.